Be Seeing You, Patty | YesBiscuit! We said goodbye to Patty today. She had been declining at a rapid pace recently and the vet determined she was riddled with cancer with no reasonable options for treatment. She was 9 years old. Nicknamed Peanut Butter Patty because of her love of skillfully polishing the insides of peanut butter jars, she was very special to us. She never had a harsh word for anyone and despite being the former target of Linus’s aggression, she remained his only friend until her death. Patty vigilantly mourned at the graveside of each of our dogs as we buried them over the years. Today it is her turn to rest. We already miss her loving nature and kind heart. She was one of those dogs who make you want to be a better human. I am very sorry for your loss, Shirley. My heart hurts for you in the loss of your precious Patty. So very sorry for your loss….She will be waiting for you at the Bridge…. What heartbreaking news. This is so sad and I’m sending out good karma and comfort to you and Billy. So so sorry. Sorry for the loss of your special girl Patty. Our hearts ache when they have to leave us but they will stay by your side in spirit until you are all reunited again. I’m so sorry Shirley. What a nice tribute to this special girl. So sorry for your loss, what a beautiful sweet face. Hugs! It is always heartbreaking to lose our furbabies. You are in my prayers. So sorry about your loss of Patty. She looks like a wonderful dog! I’m sorry this happened & know she will be greatly missed. Ah, damn. So very sorry. She was well-loved and will be deeply missed – clearly, she lived a good life with you. I”m so sorry for your loss, so hard to lose a loved one, four legged or two. I’m sorry for the loss of your sweet one – she’s with you and you will see her again. I am so sorry for your loss. I’ve lost three of my wonderful dogs this year. I know they are free of their pain and are together. They gave me 13 wonderful years for which I am eternally grateful. I know I will see them again as I am sure you will be reunited with your sweet Patty. So very sorry for the loss of your Patty, a very special girl. Another star in the sky . . . run free with your friends who have gone on before, Angel Patty. Peace and comfort to your family who love you and will miss you. I’m so sorry. Nothing anyone can say or do will make the pain of losing her go away. I know you have many happy memories that will keep her in your heart forever. Oh Shirley . . . my heart breaks for you. So very sorry. Shirley – No words can take away the pain in your heart but please know you and Billy are in my thoughts. I hope you will keep Patty’s wonderful memories close to your heart so when you think of her, you will remember them and only smile. Sending you hugs from Memphis! Shirley and Billy, I am deeply sorry for your loss of Patty. I remember when she and Linus were born and over the years through Flickr, etc. watched her grow up. 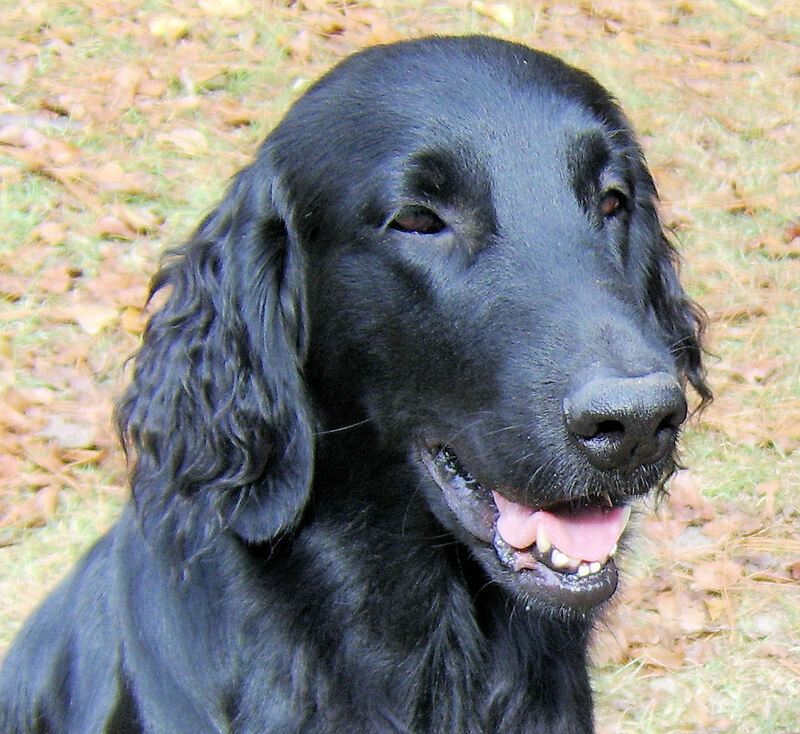 It is never easy to say good-bye to one of our Peter Pans, for they fill our lives with a special kind of love that only a flatcoat can share. Hugs from me, Seeker and Magic. I’m so sorry to hear of your loss of Patty. So sorry for your loss. Flat-Coats are even harder to lose than most dogs. They’re so loveable! Damn cancer! I’m very sorry to hear this. Our dogs are such a huge part of our lives. Peace to Patty and her humans. I will ask the folks to look for her. What a gorgeous girl. I am sure you will miss her so. I am thankful for the time you had together. Thank you to everyone for all the kindness. Your support means a lot to me and to Billy as well. It makes the stumbling through a little easier these first days. I will be back on the blog tomorrow. Shirley and Billy, I’m so sorry for your loss. It’s hard to be without someone you loved so much. always sad when they go but they really never leave..
Shirley I am so sorry for your loss. Patty looks like she was a special furbabie. God Bless Patty. God Bless you, Shirley. You WILL be together with Patty again someday. I promise. You often call out my outrage often accompanied by tears, but today you released a flood of tears and grief that caught me by surprise. Your eulogy captured that magical quality really sweet dogs share with us. Dogs inform my every act, sitting on my shoulder the unattainable ideal of unfettered joy and honesty. Optimists all shaming the best of us with their effortless ability to dive into their too short lives with such abandon and conviction I cant imagine they would waste their time with the likes of us. But God I’m glad they do. Godspeed, Patty. Y’all will meet again one day.